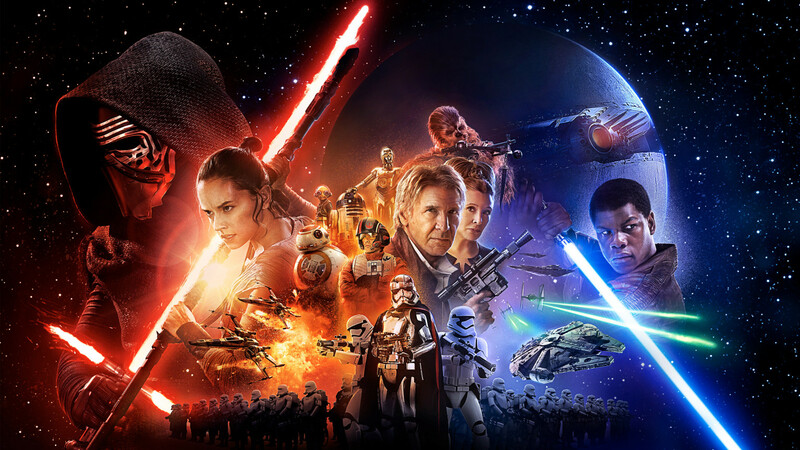 Star Wars Episode VII – Movie Review (2015) – Another Movie Blog! That is the first line of Star Wars: The Force Awakens, and it pretty much sets the tone and intent of the film. The Star Wars prequels are generally reviled movies, and the new team led by JJ Abrams knew they have to win back a lot of those people to the fold. But it also knows it has to set up a whole universe moving forward, one that can’t just be based on pre-existing material and had to make us care about a whole new band of characters. So it becomes a weird mix of fan waving to old films that moves away the path for adventures ahead. There’s the often-remarked line from George Lucas where in a Phantom Menace production meeting he says of the references to other films in the saga “It’s like poetry. They rhyme”. That is laughed at even now, but this movie REALLY took that idea to heart. I was almost tempted to tick the “I’ve seen this movie before box” as a joke for how close the plot is to the first Star Wars (which I don’t want to call A New Hope). But although nearly every beat of that first movie is here they are also in different scenes and places. The first Star Wars was built on the Joseph Campbell “Heroes Journey”, and Force Awakens is built upon the “Heroes Journey” by George Lucas. This is both a strength and weakness to the movie. At times I was really frustrated with just how safe they were playing things. Regardless of what you might say about the prequels (and I do, all the damn time), they would continuously show off new worlds and places we haven’t seen before. Here there is “not” Tatooine (Jakku), “not” the rebel base, “not” Hoth and, oh look, a “Death Star” that is not actually a Death Star. It also helps make comparisons to the first film wide open, and whilst the original is maybe the most perfect blockbuster ever constructed (until Mad Max: Fury Road of course!) this has the modern blockbuster problem of being elongated for elongated-sake. But just as JJ Abrams Star Trek‘s entire plot was based around justifying a reboot of the old crew for a different age, the similarities of The Force Awakens also help justify a plot about a new generation learning the stories and joining in on the team. This thankfully does not have the problems of Into Darkness being Wrath of Khan. It might steal beats but at least it is honest about it. If this film got one thing completely right that the prequels simply didn’t, it was introducing new characters to the world that we care about. I cared about Finn. I cared about Rey. I cared about Poe (though Poe should have had way more screentime). I even cared about Kylo Ren, all of whose stories (particularly Rey’s and Ren’s) I will not spoil here (I will spoil that you should probably be disappointed in Captain Phasma, in that like Boba Fett she doesn’t really do anything). This is helped of course by the new actors. John Boyega just always looks like he is having the time of his life (without that being distracting). Adam Driver plays Kylo Ren as though he was deliberately trying to show that Hayden Christensen’s arc in the prequels could have been good. Daisey Ridley is a brilliant find and a new great female action hero to the world. And Oscar Isaac is just a goddamn born movie star, who makes the best transition from great actor to lovable action rogue since, well, Harrison Ford. Speaking of Harrison Ford, yes, as a fan of the movies seeing the old characters on screen again was a joy (even if I have reservations about Luke being the MacGuffin). I was worried about Harrison Ford after he phoned it in for Kingdom of the Crystal Skull, but here he never let me doubt for a moment that he WAS Han Solo. The chemistry between him and Carrie Fisher is still great, and the new cast and old cast merged together in such a way that had fun and gravitas (both missing for far too long). I may have some problems with Star Wars: The Force Awakens – like wasting the Raid cast NOT doing a proper fight scene. Why? WHY?! – but none of them make me not want to see future movies ahead; the sequel is being written and directed by Rian Johnson, so we are in incredibly good hands. The fact that this movie is actually fun with compelling characters instead of just empty spectacle (*cough*Jurassic World*cough*) is almost a goddamn miracle. Must have been the will of the Force. Oh, and BB-8 is awesome and adorable and I want one.